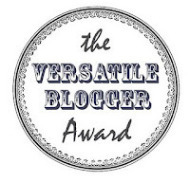 The post I didn’t expect to be writing for today…….I was nominated by Pretty Lady Baby for the Versatile Blogger Award! Which is more than a little exciting, given that this blog is only 3 weeks old! So, I am very grateful, and would encourage you to look at Kerrie’s blog – she is enthusiastic about quilting and all things related and is just lovely. Nominate up to 15 bloggers for the award. Ooooohhhh…..bloggers to nominate for the award……so many to choose from! 2. If I am having friends over for dinner I always plan the dessert first and then the rest of the menu – dessert is my favourite part of eating dinner, and my favourite part to prepare! 3. I was taught to sew, crochet and cross stitch by my mother and my grandmother. In my late teens and early 20’s I would sew my own clothes, including formal outfits (because back then we went to ‘balls’) but then I stopped sewing much more than the occasional set of curtains until last year when a request from my daughter started me off again. The snowball effect has been impressive! 4. I am a fabric addict – I see new patterns and designs and start dreaming about what I could do with them until I buy them…..and then they often sit in my stash for a while until I remember what exactly it was that I had planned for them…..
5. Making things, whether through sewing, crochet or baking, keeps me sane. So, there it is. If I have nominated you and you don’t feel like taking up the award, I do quite understand – being a trained cynic I am never sure if these things end up being like chain-letters…..but as this is my first one, I am happy to participate! This entry was posted in Uncategorized on February 1, 2013 by a little bird made me. Glad to see I am not the only person who love exclamation points! My Happy Husband’s love to tell me I am easily excited!! LOL…I also love birds…in stationary, clothing, fabric or art. My dog Zeus would really have a fit if there was a bird in here. Thank you so much! I am flattered! This is the first time I’ve ever won an blog award! Also, I have the same problem with exclamation marks. I will be sure to follow the rules. Thanks so much for the nomination. It’s so kind of you! But, more than anything, the nomination you have received is well deserved. Your blog is a joy to read! Jo – I suspect that I have been subconciously workshopping myself out of my bird ‘issues’ without even realising! Blog away lovely expressive friends and exclaim as much as you like!!! !